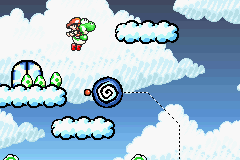 Exercise in the Skies is the first Secret Level in Yoshi's Island: Super Mario Advance 3. The level starts out with Yoshi in a small grassy area. He soon comes to a cliff, where he has to ride various Flatbed Ferries (many of which fall off the tracks shortly after being landed on, forcing Yoshi to jump around a lot), to reach the top of some clouds, where there is a Middle Ring and a door. If the player jumps off the Flatbed Ferry at the right moment it will take them a secret area, where they will use an ! Switch to collect some Red Coins and a Flower. Through the door is just more clouds, and after crossing a long gap, Yoshi finds another door which leads to the next area. At the end of the section, if the player destroys some dirt they'll reach another secret area where they can get some more Red Coins. In the next area are some is a Flatbed Ferry that leads to a another Middle Ring. After the Middle Ring is a section with another Flatbed Ferry and some Falling Rocks. At the top of the Falling Rocks is an ! Switch. Hitting the switch makes red blocks appear, and jumping along those brings Yoshi to the end of the level. French Exercice dans les Nuages. Exercise in the Clouds. This page was last edited on March 19, 2019, at 23:42.